The town of Newport Center, Vt., is a small community of approximately 1,500 residents located just south of the U.S.-Canada border. A combination of drought and increased water use required the drilling of a new well for the community to supplement the two wells already in service. Water quality testing of the new well found arsenic levels at 20 ppb, well above the drinking water standard set by the U.S. Environmental Protection Agency (EPA) and the state of Vermont of 10 ppb. Due to the elevated level of arsenic in the water, the town had to purchase water from a neighboring community and haul it to a storage tank, where it went to distribution. This temporary solution became costly and inadequate, and a more cost-effective and permanent solution was needed. In May 2012, engineering firm Aldrich + Elliot contacted AdEdge Water Technologies LLC to design, manufacture and start up an arsenic removal system for the community. The treatment system fully integrates with the existing equipment on site, including a hydropneumatic tank, gravity feed to a concrete storage reservoir, and gravity feed distribution system. 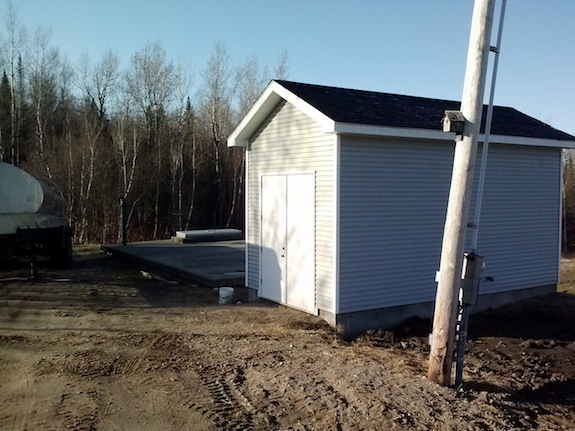 AdEdge designed a system that delivers water at approximately 18 gal per minute (gpm) for 350 of the town’s residents. The company provided a skid-mounted adsorption packaged unit rated for a maximum design flow of 20 gpm. AdEdge Packaged Unit systems are designed as turnkey treatment solutions for a variety of contaminants. System features include differential pressure switches, local control panel and gauges, flow sensors and totalizers, and a central hydraulic panel with sample ports for chlorine monitoring. A relay control panel also is included in the system to control the well pump, treatment system, backwash supply pump and backwash/recycle system. Prior to entering the system, water is pumped from the well and injected with chlorine (sodium hypochlorite) via an ADIN chemical feed system to oxidize any arsenic (III) to arsenic (V) for optimal removal. After it is treated by the chemical feed system, the water moves into an adsorption treatment system utilizing AdEdge E33 granular ferric oxide media. The media has a high capacity for arsenic and is delivered in a dry, non-crystalline form. It is robust and easy to handle, and is stored and shipped dry. It has received NSF Standard 61 approval for use in drinking water systems. The adsorption system consists of two 24-in.-diameter-by-65-in.-tall composite tanks in a lead/lag configuration. In this configuration, water goes through the first vessel and then the second vessel for optimal arsenic removal. The configuration is also reversible, so if the first vessel nears breakthrough of the media, the vessels can be switched for maximum media capacity. The arsenic removal system requires backwashing to remove any accumulated suspended solids in the treatment vessels. 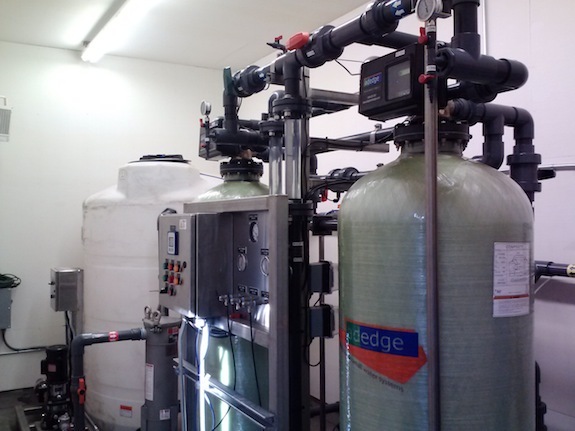 An H2Zero backwash/recycle system is integrated with the control panel to conserve water by storing and treating the contaminated backwash water from the adsorption system. The source of the backwash water is a storage reservoir that uses a backwash supply pump to provide the 28-gpm flow needed for the backwash cycle. Backwashing occurs only once a month due to the low level of suspended solids in the water. Richard J. Cavagnaro is marketing coordinator for AdEdge Water Technologies LLC. Cavagnaro can be reached at [email protected] or 678.730.6506.